Memory foam seat, mesh back, and gel lumbar support are three main reasons why the Nightingale CXO Mesh Chair with Headrest Option 6200 & 6200D change the game as far as office chairs are concerned. The Nightingale CXO 6200 Chair and Nightingale CXO 6200D Chair with Headrest deliver modern styling and work-altering comfort in the form of a chair. Cooling airflow from the mesh back complements the cushioned, memory foam seat and gel lumbar support so you can sit the way you want comfortably. It aids in all-day tasking, giving your lumbar region and body the support it needs. This ergonomic beauty sweeps the category for its superior design, having earned Design Journal's ADEX PLATINUM Award for design excellence. Stylish, award-winning, and ideal for anyone from designers to executives, you'll be sitting pretty in ergonomic comfort in no time. 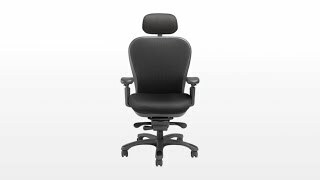 The Nightingale CXO Chair 6200 can be ordered with or without a headrest. This headrest has been completely redesigned to be easier to maneuver. Choose between black or silver for the back mesh of the Nightingale CXO 6200 chair. Good, not great. Not worth the money. Pretty nice chair overall but not worth $1,000. The seat is very nice for working long hours and the back support is acceptable, but doesn't compare with Herman Miller Embody's or SteelCase leap's. Adjustability is alright. I would like the lumbar support to go a bit higher but that's just me. The head rest, even at the highest position, pushes against my lower neck. You can't actually rest your head on it unless fully reclined, anyway...and by then you're staring at the ceiling. Also, after only 3 days, the left arm rest started creaking on the rare occasion I do use it. Pros: Comfortable seat, can sit in for a long time. Decent back support. Cons: Arm rests are too far away to use properly with a desk despite adjustments. Head rest is useless and pushes against lower neck / upper back. Pros: It is a very solid chair - heavy and obviously well built. Overall it is comfortable with plenty of adjustment variation. Armrests are nice and wide and I can always get them right where I want them. The seat cushion is nice and plush and the back of the chair is well formed. The headrest comes in handy when I'm on the phone and want to stretch back a bit with some support. And I like that the back is tall - I really liked the Aeron as well but the thing that kept me from purchasing one is the fall off at the top of the seat - I was always searching for more upper back support in the Aeron. Also I wanted an option for a headrest that was OEM. Cons are few but, I feel, significant: I'm not sure if it's the angle of the area where the back meets the seat or the shape of the back/seat, but even with the lower back support pushed all the way in toward my body, I still would like more support in that area. I'm not sure if what I'm looking for is a broader support area rather than the horizontal foam pad... it just seems to not work as well as I'd like. The chair seems to allow me to slide down a bit as time goes on, adding pressure to my lower back. I still step away at the end of the day with some lower back pain which did not happen with the Aeron. It's not terrible but just something to consider if you have similar issues. Overall it is a very nice chair and I do not regret spending the money on it. It may not be what I would purchase if this one was broken but it's a good unit. The Human Solution had an expert (forgot his name) that showed me this chair and how it would help my back. I gave it a try and can say that this is by far the most comfortable chair I've ever owned. I sat in many ergo chairs but wanted a chair with good cushion. This is it. Thank you for this chair! I almost bought an Aeron but Kara said that the seat and lumbar on the Nightingale CXO is a lot more comfortable. I've sat in an Aeron before and Kara was so right. Thank you for suggesting the CXO because I'm a happy camper. $975.00 List Price: $1,845.00* The list price is the same as the MSRP (Manufacturer's Suggested Retail Price). It may not necessarily be the price at which the product is sold.